We finally had a chance to visit the Exploratorium, which reopened in April, in its new location. Now at Pier 15, it's more convenient to other family attractions for both tourists and locals (unless you live in the Marina, in which case, it's further). 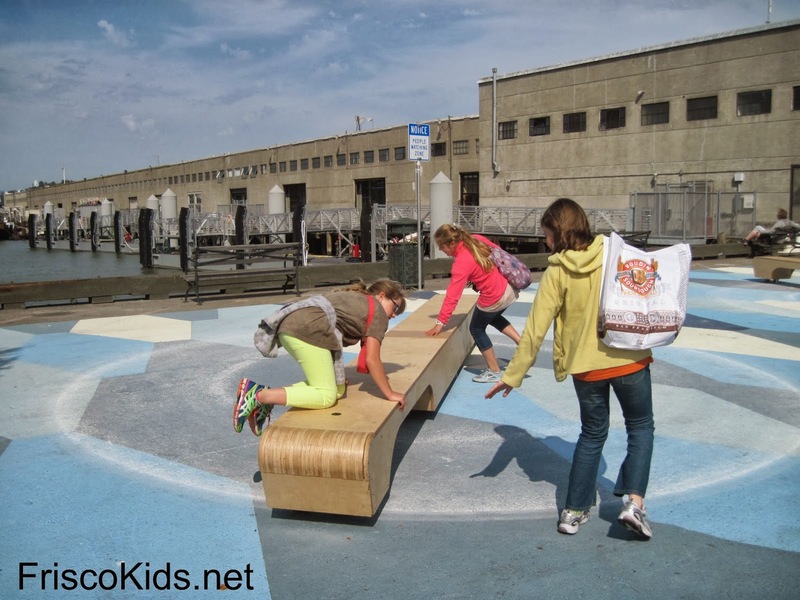 We started our day at Fisherman's Wharf, working our way along the water to Tcho for a factory tour, the Exploratorium, and finally to the Ferry Building. 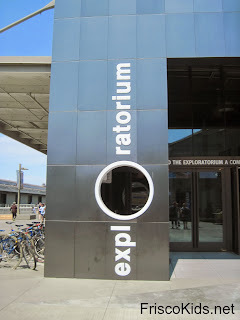 Unfortunately we only had about 2 hours for the Exploratorium that day - tight scheduling on our part. It was not enough time to see everything. Then again, one of my children was having a melt down so we probably couldn't have stayed much longer anyway. I recommend getting a membership and going several times so you won't feel you missed out! One of the differences in the new site, is that they have some outdoor fun - that's free - even if you're not going inside. They had several interactive exhibits, and we had to push the kids along to get inside to see the rest. They would have been happy hanging out outside exploring! Some of the things inside looked familiar - some were definitely new. The place is so vast that I'll just show you some of the exhibits we saw. One favorite was this one on language (below). 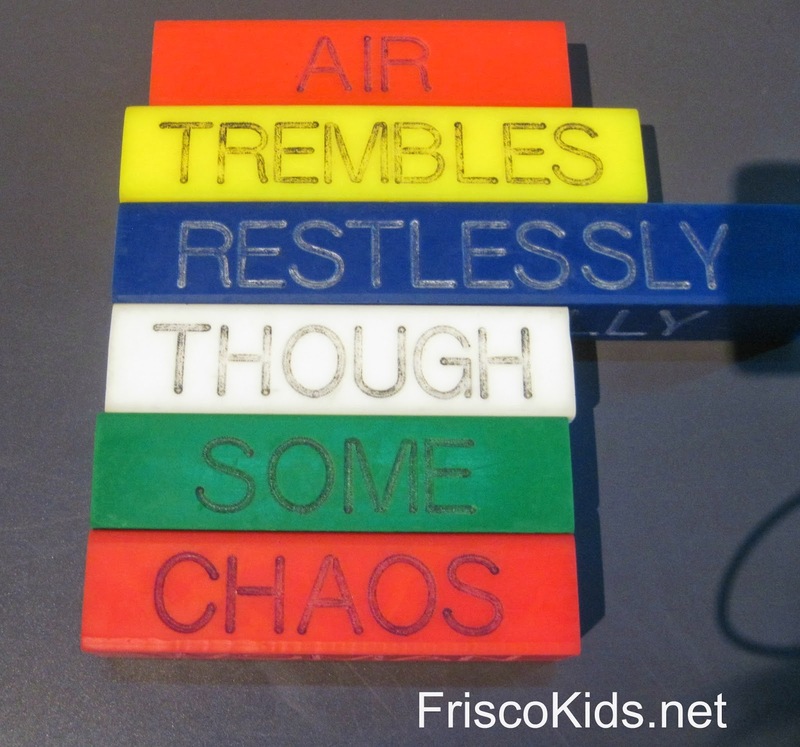 You pick cubes of different colors, representing different parts of speech, and put them together. You can shut your eyes and pick, or look for something fun. 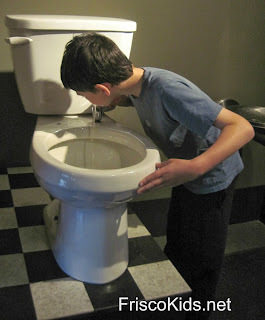 Of course the toilet bowl water fountain has been around for some time, but I still have a hard time not feeling squeamish watching my son drink from it! 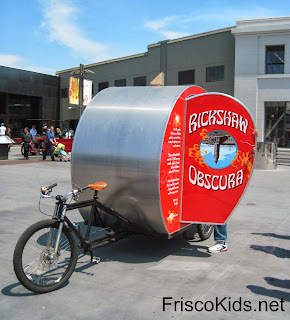 Again, this exhibit with the bike wheel isn't new either, but it's still interesting. 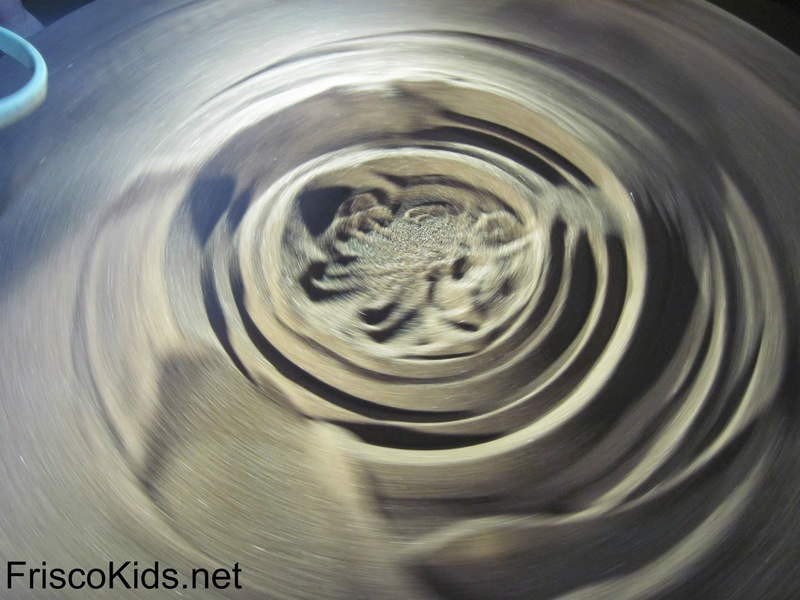 As it spins, you can tilt the wheel, and the chair goes in a different direction. We spent A LOT of time at the sand sculpture area, with its pendulum creating different designs. 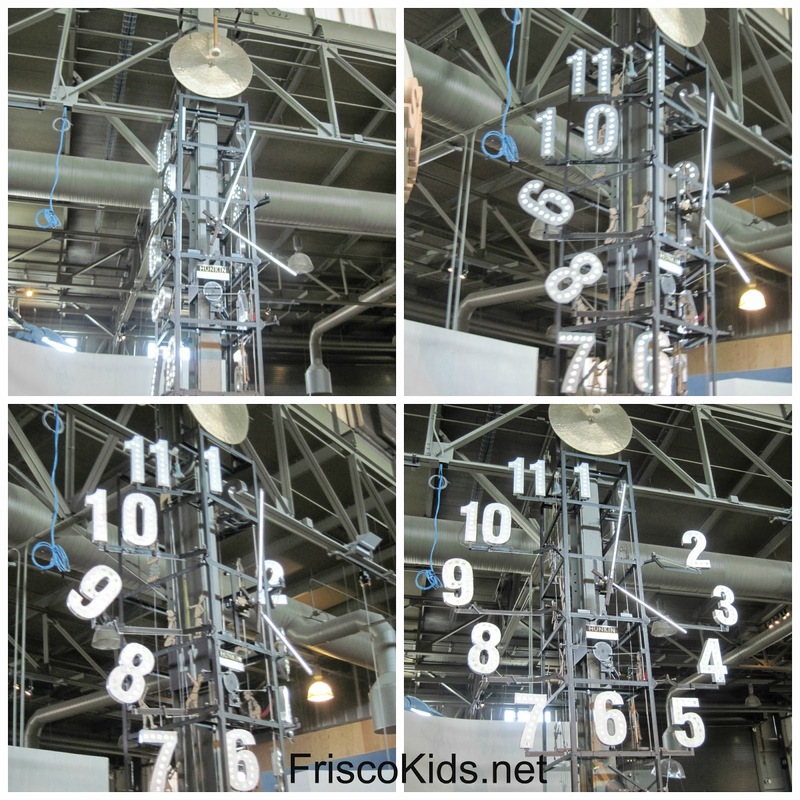 The clock was my favorite exhibit. I walked by looking at it several times, and didn't realize that the numbers come out on the hour, with loud chimes. You can see a progression of the clock's numbers unfolding below. What's not shown is that when you walk around the clock, you'll see mechanical metal workers doing their thing during the rest of the time. It's quite fascinating and interesting piece of art. Make sure you're there on the hour to see what happens. 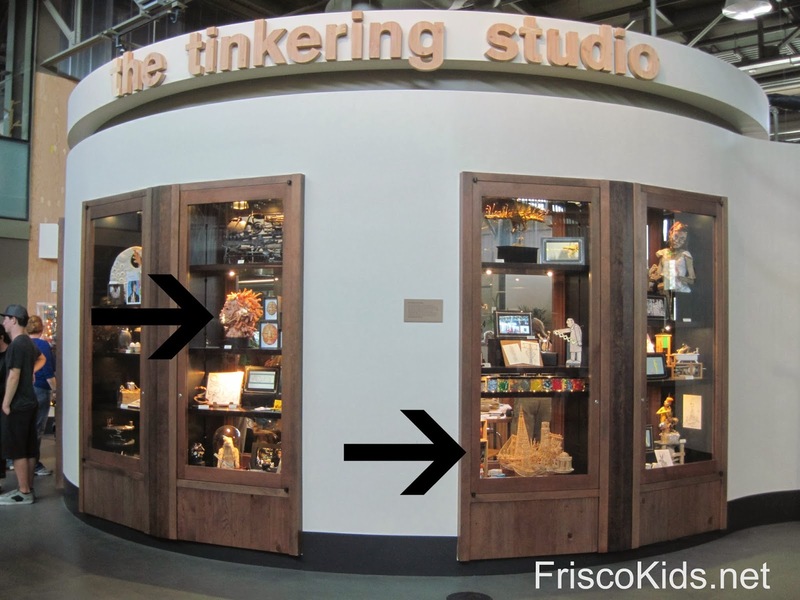 I don't recall the Tinkering Studio from before. The windows you can see below have interesting things made by tinkerers, including a toothpick sculpture of San Francisco (see arrow in the middle), and a fabulous Medusa sculpture made out of doll heads on the left. Go take a look. Behind the wall is an area where you and the kids can tinker. Again, we spent a lot of time in the shadow area, which was large enough for at least a dozen kids to make pictures on the walls with their shadows. Getting good photos was another story, but the one below turned out pretty well. Do you recognize it? I usually don't use my camera for video, but I did below. This is the Penguin and Batman LEGO sculpture that was fun to watch. What do you think? 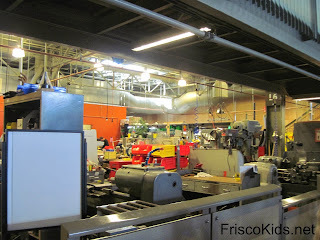 The Exploratorium has a huge area you can't go into, where they develop new exhibits. You can see part of it below, but it's much larger than this. I loved the chairs, which provide perspective. The kids had fun on them too! Reminds me of Goldilocks and the Three Bears. 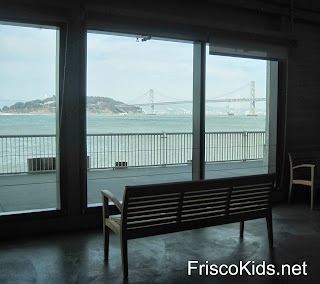 In the back of the Exploratorium, are fabulous views of the Bay Bridge and Treasure Island. Obviously that bench is put to good use! You can walk around outside as well. 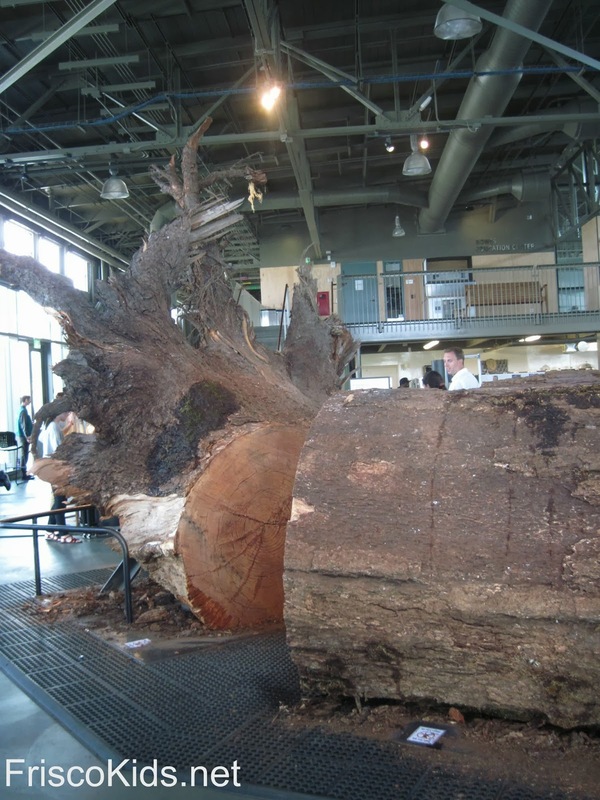 The back also has some natural exhibits, including this fallen tree. You can see how large it is by walking through the cut portions and try to count the rings. I have tons more pictures, but like going to a museum, there's only so much someone can absorb at any given time. So I invite you to go yourself and tell us what your favorite part was! On our way out, we spent some time at this other outdoor exhibit, which turns. The kids had fun pushing it and riding on it. By the way, the Tactile Dome reopens October 30. My kids haven't been yet, but I think it's awesome and can't wait to take them. You'll need reservations, and you'll need to plan an hour for the experience. There's an additional fee ($12/member, $15/nonmember). Kids have to be at least 7 years old. 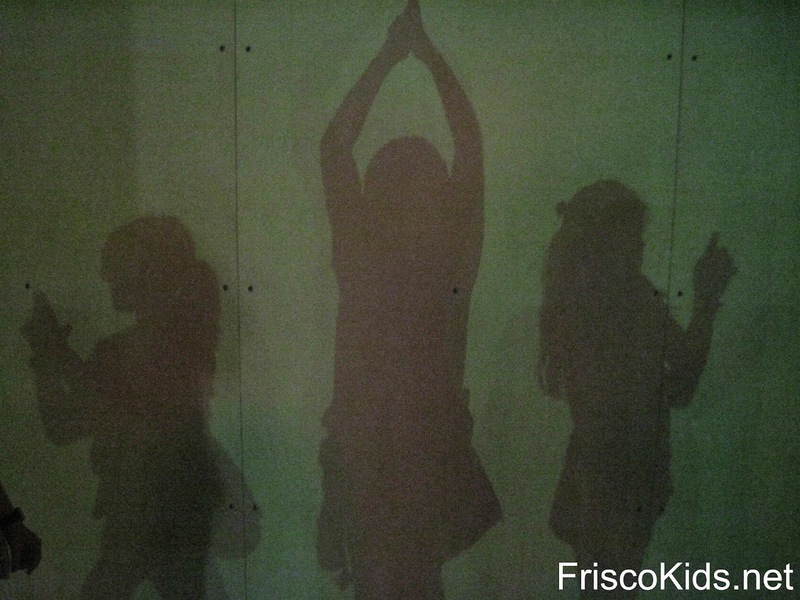 Disclosure: the Exploratorium gave us tickets to facilitate the review. Do you think it's a good place to take a toddler (2.5 y)? We go to BADM and the Academy a lot and i would love something new ( more for me than him). What a cool place! I could NOT drink out of that fountain.